President Trump announced tariffs of 25% on targeted, but yet to-be-determined, Chinese products in response to a “tremendous intellectual property theft situation.” He then described the trade deficit with China and requested it be reduced by 25% immediately, ignoring that the official cause of the tariffs was intellectual property theft. As I have been discussing since my 2017 annual letter to clients to recent “Macro Monday articles,” one of the major challenges the Trump administration faces is overcoming nationalist tendencies to improve the already favorable U.S. trade position in the world. The President’s tariff actions, these, as well as, those on solar, steel, aluminum and highly strategic washing machines, are another step towards walking a ledge that could plummet the world economy into recession and the stock market to crash. Investors that rely on the total return of their investments to pay for their retirement now or in the future, should be concerned. 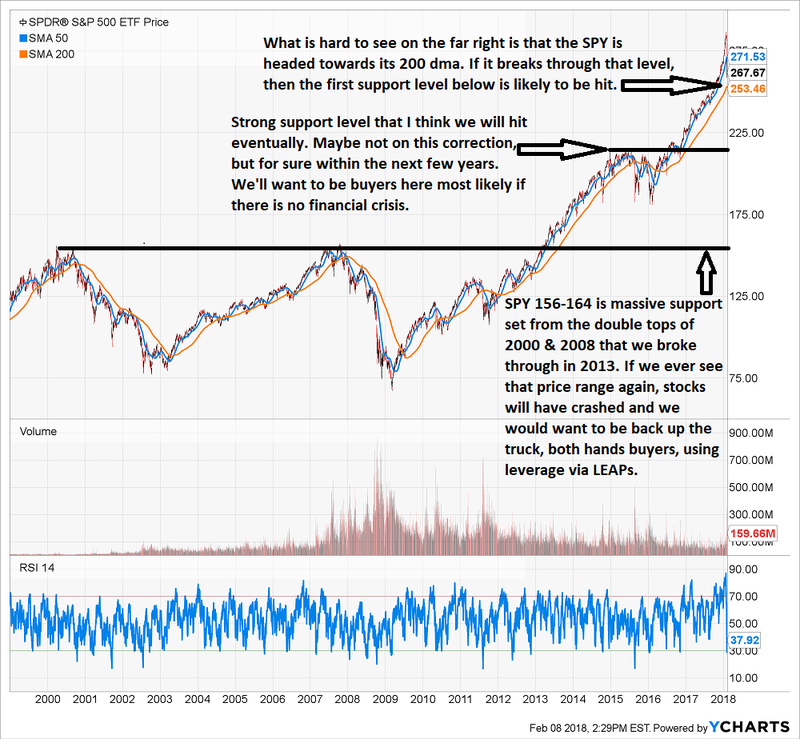 What I described in This Correction Could Have Another Leg Down has become more apparent, the stock market is now a “sell the rip” market, and no longer a “buy the dip” market. Investors should be very aware and beware. A U.S. Trade Representative fact sheet describes the tariff action. The Chinese ambassador to the U.S. made a point of stating that “China would fight to the end to defend its own legitimate interests.” Not exactly a comforting thought. The stock market got scared and had its fourth loss of the year over. By Thursday night, China had put out a list of over $3 billion in trade responses to the impending U.S. tariffs and stated there was more that could come. What Americans who politically or empathetically support the tariffs do not understand is the inflationary impact that these tariffs can have. As we raise prices on China, they will raise prices on us. The idea that we are more immune to tariffs is very wrong. Because we import more, we will feel the impact of inflation more – lowering our standard of living. As Deutsche Bank just pointed out, there is a very real possibility that on top of inflation, we could see recession, from a trade war. I think that is likely in fact. I discussed the “stagflation” scenario in an article linked below. Further, the U.S. trade deficit is a function of the U.S. being rich enough, largely on trade and currency strength, to be able to afford to import goods and services that we do not provide as cheaply. It is a fallacy that having a large trade deficit is necessarily bad for the economy. Deficits can be an impact of “comparative advantage.” In the case of the U.S., that is exactly what it is. America carries out certain economic activities more efficiently than others. We carry out more complex and highly paid activities than most of the rest of the world, including China. It is a dramatic economic mistake to fight over bringing back lower skilled, lower paid jobs as that will deteriorate American wealth and standard of living over time. While it plays well with the lower skilled and less economically informed to strike out at China, there are far more efficient methods to handle legitimate claims on intellectual property and trade issues. In poker, which I play at a fairly high level (winning amateur, wasting time pro), risking your chips for little gain never makes sense. That is the play that President Trump is making however. 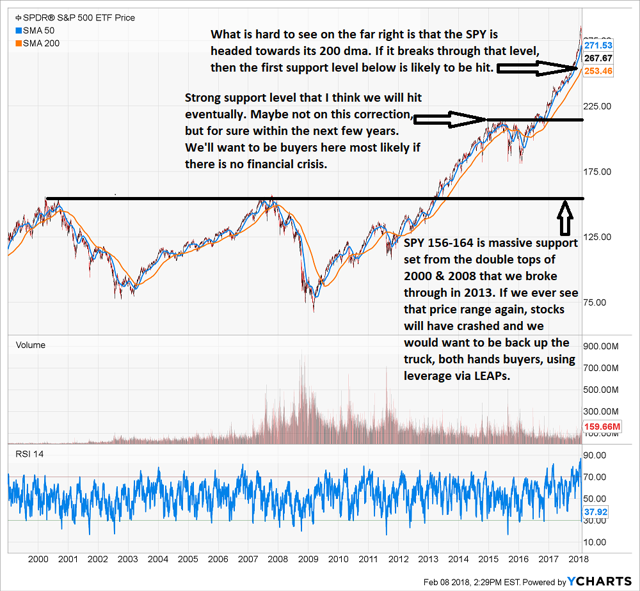 It is such a bad play, that members of my investment letter and I were able to make money using puts on the SPDR S&P 500 ETF (SPY) in recent weeks, including yesterday and today, on the President’s bad plays. This is the tip of the overvalued iceberg coming home to roost on an unneeded catalyst. Stock market futures are down as I write this a couple hours before market openings. Here’s where investors need to clean the sleepy bull market dust out of their eyes. 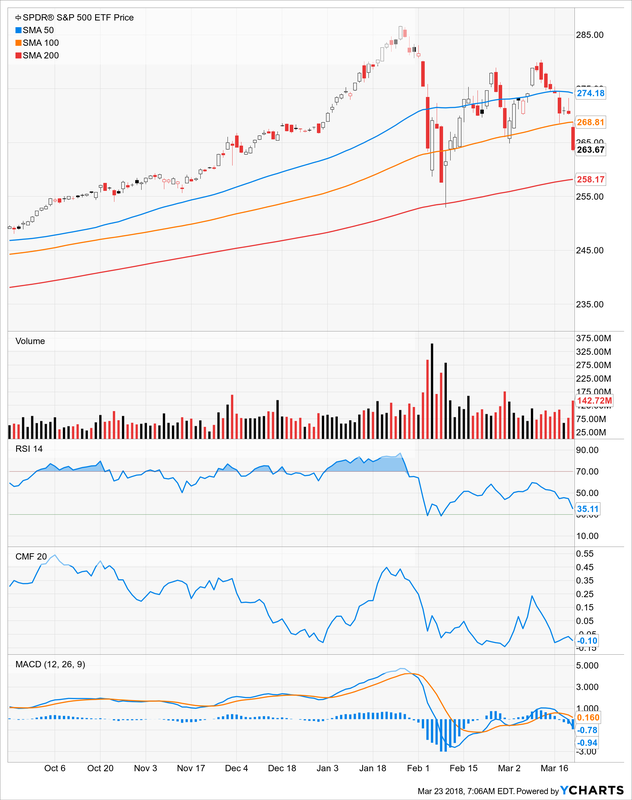 If this develops into a trade war, and it has begun to look that way, then there is a large drop that stocks could see. The S&P 500 is likely to break through its 100-day moving average today and close below it for the week. This could lead to a break through the 200-day moving average. As I illustrated in “Here’s What Gary Cohn Sees: Tariffs = Inflation + Slow Growth = Stagflation,” there are significantly lower levels that the U.S. market could experience if it breaks the 200-day moving average. It seems President Trump has chosen his course, so prudent investors need to look for opportunities to protect themselves. There are a few things to consider. First, what are the President’s “outs.” I think the first one is he tries to cut a deal on U.S. natural gas exports to make up the trade deficit concerns and back away from tariffs. Such a deal makes sense as we have the natural gas to export and China needs it. Further, it could mitigate China’s desire to help Iran should we sanction them again. More on that whole dynamic in a separate article. I don’t know if a natural gas deal will come to pass. It might. It might not. Either way, I think it is a valid speculation, that should we avoid recession on all of this, then natural gas could be part of the solution in the trade issues with China. My favorite natural gas exploration and production company is Antero Resource (AR), which I have only discussed with members to Margin of Safety Investing so far. I am actively accumulating shares in Antero. From a more defensive standpoint, as I have been saying for months now, building a cash position to 25-50% of a portfolio is a good tactical move. While some are able to do that accumulating dividends over long periods, and intermediate periods selling options like I do to augment portfolios, sometimes selling holdings is the more immediate necessity. I recommend selling assets that are economically driven and sensitive to inflation. That could mean stocks heavily impacted by steel prices or consumer demand. Selling down of appreciated assets, though maybe not total liquidation might be right for you to build a more defensive asset allocation. Boeing (BA) Aircraft are the U.S. #1 export to China. Airbus is a natural pivot for the Chinese should they wish to retaliate without even using tariffs. Semi-conductors are a major export to China. If China is in fact stealing technology, then it stands to reason they can replace these component makers with some planning. I doubt if that is true, but it does throw into a special light the accusations that President Trump is making. Skyworks has about 80% exposure to China, while Micron and Nvidia about 50%. Cheniere Energy (LNG) Liquefied natural gas is among the fastest growing exports to China. Cheniere recently cut its first deal with China. If this is not part of the trade solution, it could be part of the retaliation. I do believe that a solution is likely to be reached with China. They cannot really afford to not to work something out with us. There is an exception to that likelihood however. President XI might be so pissed off that he takes a recession in order to punish Trump and set-up for negotiations with the next President. Remember, if we go into recession, the President generally loses badly upon his re-election bid. There is already bad underlying feelings emanating on the Trump presidency and Congress after the tax bill – see the recent special elections for clues. It isn’t hard to imagine China taking the role of “anti-Russia” in the next election. Let’s say a solution does work its way out. Maybe XI can get the best of Trump in two ways. Maybe he can help instigate a recession in America and get our natural gas. It’ll be interesting to watch. For me, I like a heavy cash position and exposure to energy, as well as, a few VSL names. If Micron drops on fears of a trade war, that will be a buying opportunity for the future of IoT and tech development.